One of the most handsome baby boy ornaments you're likely to find! 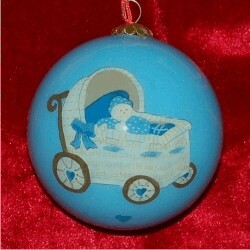 The baby buggy for boys glass ball personalized Christmas ornament is the creation of one of today's top ornament artists. She paints on the inside of a clear glass ball, so the image you see won't ever get scuffed, scratched or worn. Ornaments of this quality usually cost more than $50, but we're pleased to offer this premium blown glass piece at less than half of that. The baby buggy blue personalized Christmas ornament includes our cord for hanging it wherever the new parents or grandparents will enjoy it best. Browse our engagement, expecting, family and baby ornaments personalized by our calligraphers to discover other treasures from the same artist.